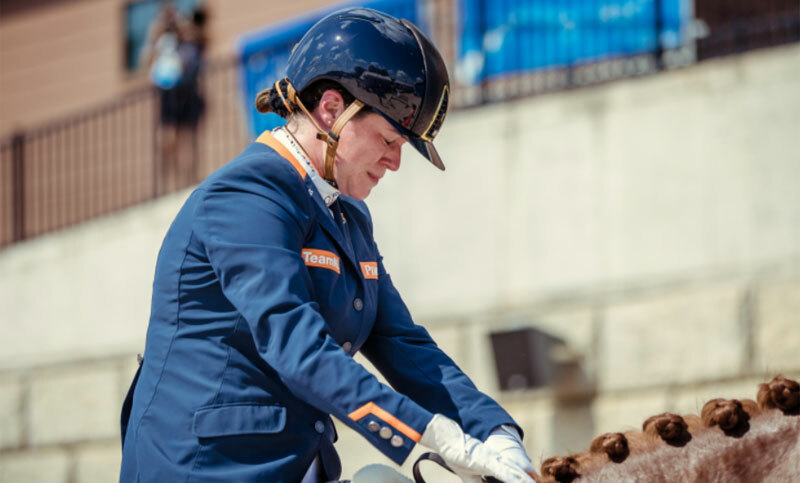 The Netherlands has taken commanding control of the Team competition at the Adequan© Para Dressage at the FEI World Equestrian Games in Tryon, USA. With three riders out in the arena today, the team is currently on a score of 150.038 (with the lowest score of the day not included), and has its Grade III world champion Rixt van der Horst still to ride tomorrow. With all the French riders having competed today, they finished up with a maximum total score of 199.998. Denmark and Great Britain are close behind the Dutch with scores in the mid-140s and both have two more riders to go, setting Friday’s second and deciding day of the competition up to be a real thriller. The Dutch dominance came despite Great Britain’s Sophie Wells giving her team the best possible start to the competition in the first test of the day, the Grade V. Riding C Fatal Attraction, Wells scored a personal best of 77.233%, the highest score of the day, just a fraction off the world record and nearly four points ahead of second highest Grade V scorer Frank Hosmar, from the Netherlands. Frank was riding Alphaville N.O.P. and scored 73.488%, while Germany’s Regine Mispelkamp had the grade’s third score on Look At Me Now with 72.792%. Speaking after her ride, Wells said: “You learn to deal with the pressure and I just focussed on what I needed to do. We want to retain our title but we can only do the best that we can do. In the Grade II test, Denmark’s Stinna Tange Kaastrup was also the first to ride and, like Wells, was the highest scorer of that competition, setting her country on a good start for a medal. Denmark ran Great Britain close to the title at last year’s FEI European Championships in Gothenburg, and the country has high hopes of going one step further this year. The Netherlands’ major push for gold today came from Grade IV rider and the new individual world champion Sanne Voets. On Demantur N.O.P she posted a massive score of 76.550 to really up the pressure on the British. Brazil’s Rodolpho Riskalla, fresh from his silver medal in the individual was second in the test, on Don Henrico and with 74.650%, while Belgium’s Manon Claeys posted a highly respectable 73.150 on San Dior 2. “He was amazing,” said Voets. “He was so sharp, and willing, and obedient and with me and this is what makes it so beautiful when two become one – when a horse and you are in perfect harmony. “There were some mistakes, it wasn’t flawless and there’s still room for improvement but he just felt so amazingly confident and relaxed. I have no words for it, he’s such an amazing horse. Some 14 countries are competing in the team contest, each with three or four across the five Para Dressage grades. The top three scores from each team then combine to determine the overall winner. This year’s competition has an extra frisson, in that the top three teams secure automatic qualification for the Tokyo 2020 Paralympic Games.